As leaves start to fall and the trees turn from green to a bright array of red, orange and yellow, it is a sign that autumn is here. This is the perfect season to enjoy quality time with your children before the chaos of the holidays is in full gear. Go pumpkin-picking, sip a hot cup of apple cider, and set up fall beading projects to do with kids. Explore your creative side and bond with your kid by engaging in a craft beading project. The variety of bead colors available echo the multitude of colors you see outside your window during this season. Select some beads and lanyard, and you can easily get started on a new project. 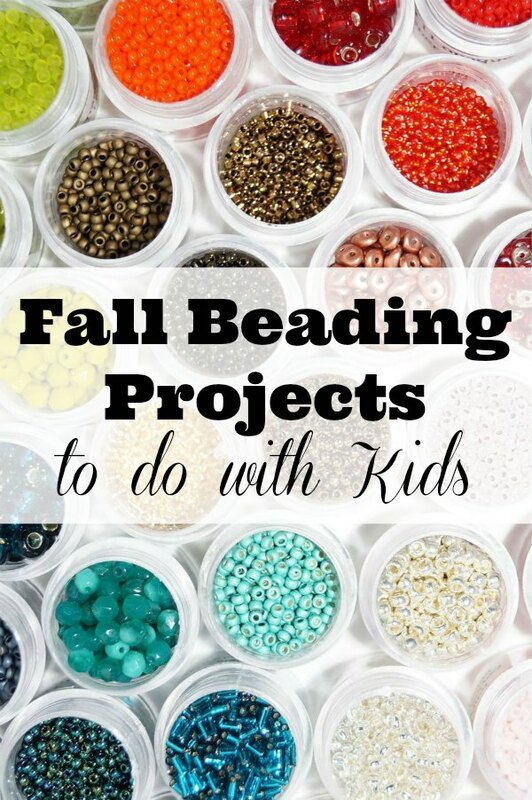 Here are some ideas for fall beading projects to do with kids. It is important that you consider your child’s age before beginning any beading project. The small beads involved can easily be swallowed, so many of these projects require close supervision. Beading projects can also involve delicate, advanced motor skills. This is an excellent learning exercise for your child to practice these skills, but it is not recommended for kids who are toddlers or younger. This list includes a variety of beading project ideas. Many are easy for beginning crafters to follow, but a few require a more intermediary skill. If you or your child love Halloween, then this is the perfect beading project to enjoy together. Create orange beads from Cutesy Crafts that you can put on display throughout the fall. Grab some orange, green, and brown pipe cleaners, along with orange beads, and you are ready to begin this project. You will create the perfect beaded Halloween pumpkin. This project utilizes beads in a more unconventional way than most beading projects. It requires melting plastic beads in the oven. orange beads from Let’s Do Something Crafty. Always provide close supervision to ensure no one gets hurt during the melting process. You will need to purchase leaf-shaped cookie cutters or use foil to create a defined leaf shape for this beading project. Consider adding magnetic clasps for a more modern, professional look. This craft would make an excellent gift for someone with a fall birthday. Here’s a creative beading project that is not only beautiful but functional, too. Enjoy spending time with your kid as you create beaded napkin rings that can be used for Thanksgiving dinner. For Thanksgiving dinner from Buggy and Buddy, you’ll need glass beads in assorted fall colors, thin wire and a wire cutter. 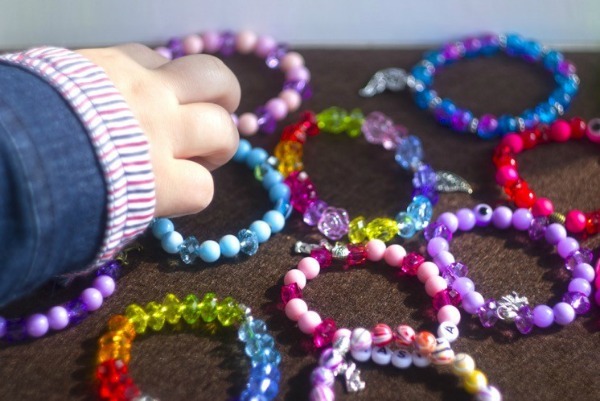 You and your child can create a perfect beaded napkin ring! This is an Thanksgiving dinner from Make and Takes to complete with your child. All you need are pipe cleaners and pony beads in assorted colors. Fall colors like orange and yellow would look great on the beaded caterpillar pet. What a cute beaded caterpillar pet that you can enjoy all season. The friendship bracelet is the quintessential craft that comes to mind when thinking about beading projects. Make one for you and your child that you can each wear and show off. This combination of pony beads in assorted colors will certainly do the trick. For even more glamour, add a pony beads in assorted colors closure that is perfect for the fall. With the holidays fast approaching, this project will have you ready to celebrate in no time. Create the perfect fall acorn ornament together and enjoy the lasting memories when you put it on the tree for years to come. This project requires a more intermediary skill and is best suited for an older child. This tutorial at Rhythms of Play. Use beautiful, large glass beads in place of marbles to create your acorn. The rustic feel of these ornaments is perfect for fall weather and are certain to stand out when hanging from your tree. Fall is the perfect time to get creative and enjoy a beading project with your kid. This craft will enhance your child’s creativity and motor skills while creating something unique that you can both can enjoy. Watch your child’s face light up as they spend quality time creating something new with you. Echo the fall colors of green, orange, yellow, and red in your creations. Enhance your beading projects with higher-quality beads made of gemstones, metal, or pearls. You can even add extra glamour by selecting design clasps or beautiful metal chains. Once the project is finished, you will have created a meaningful item and memories that last far beyond the season. Have you tried any Fall beading projects to do with kids? What are your favorite crafts to do with kids? These are some great ideas! I was looking for some things to occupy the preschoolers while the big kids are in school. They will especially love making their own bracelets. Thanks for the post! That sounds like fun! Thanks for stopping by.